Incident Details: A mother and her teenage daughter mis-routed on the way back from a walk up Scafell Pike, and found themselves in Langdale. They then attempted to correct the mistake, but got to Esk Hause shelter in thick mist. Without a compass, they were unable to find their way back to the Grains Gill path. 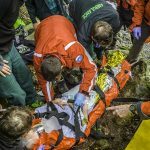 It became obvious that they had completely lost confidence, and with the worsening weather, four Team members and a search dog went up to locate them and bring them down.